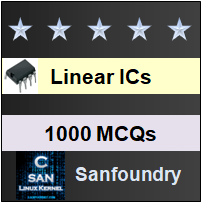 This set of Linear Integrated Circuit Multiple Choice Questions & Answers (MCQs) focuses on “Voltage Series Feedback Amplifier – 1”. 1. Specify the voltage gain of non-inverting amplifier with feedback amplifier with and without feedback? Explanation: The voltage gain of op-amp with feedback is the open loop voltage gain, A=Vo /Vid. The voltage gain of op-amp without feedback is the closed loop voltage gain, AF = Vo /Vin. 2. If the feedback voltage and the output voltage are given as 10v and 4v. Find the gain of the feedback circuit in voltage-series feedback amplifier? Explanation: Gain of feedback, B = Vf /Vo = 10v/4v = 2.5v. 3. How is the difference voltage calculated in closed loop non-inverting amplifier? Explanation: Although, the input is given to the non-inverting terminal of op-amp, the difference voltage is equal to the input voltage minus feedback voltage is Vid= Vin – Vf. 4. 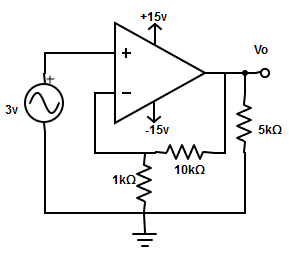 Why the feedback circuit is said to be negative for voltage series feedback amplifier? Explanation: Voltage series feedback amplifier have the difference voltage, Vid = Vin-Vf. Therefore, the feedback voltage always opposes the input voltage and is out of phase by 180o with respect to input voltage. Hence, the feedback is said to be negative. 5. Determine the closed loop voltage gain from the given circuit. (Where gain of op-amp= 105). 6. Express closed loop voltage gain (AF) in terms of open loop gain (A) and feedback circuit gain (B)? Explanation: The closed loop voltage gain in terms of open loop gain and feedback circuit gain is expressed as AF = A/(1+AB). 7. Which factor determines the gain of the voltage series feedback amplifier? Explanation: In setting the gain of the voltage series feedback amplifier, the ratio of two resistors is important and not the absolute value of these resistors. For example: If a gain of 11 is desired, we choose R1=1kΩ and R1=10kΩ or R1=100Ω and RF= 1kΩ. 8. For the feedback circuit of voltage series feedback amplifier, find the feedback voltage for the specifications: R1=1kΩ, RF = 10kΩ and Vo= 25v. The feedback voltage, Vf = (R1*Vo)/(R1+RF) = (1kΩ*25v)/(1kΩ+10kΩ) = 2.272v ≅ 2.3v. 9. What must be the value of external components used in voltage series feedback amplifier? Explanation: All external components value should be less than 1MΩ. So, that they do not adversely affect the internal circuitry of the op-amp. 10. Find the block diagram representation of non-inverting amplifier with feedback? Explanation: The mentioned block diagram is the standard form for representing a system with feedback. 11. Define the input resistance with feedback for voltage series feedback amplifier? Explanation: In feedback amplifier, the input resistance of the op-amp with feedback is (1+AB) times that of without feedback. Explanation: When the input at both the terminal are equal, the difference input voltage, Vid=Vin1– Vin2. the closed loop voltage gain, AF= Vo/ Vin = 1+ (RF/ R1).